The staff here left me speechless! The type of service i received here could have as well been at a luxury $400/night resort or hotel. They were so kind, so warm, and helped me with everything i needed. The bathrooms were so nice, this place was apotless, the beds were comfortable. Family dinners were so filling. Breakfast was made with love. 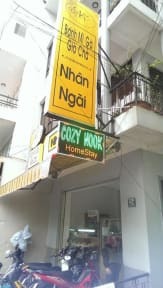 My favorite hostel in all of Vietnam! Or dare i say... All of se Asia??? Personal extremadamente amable, camas muy cómodas, piezas muy limpias, todo el tiempo. Buen desayuno, family dinner, si bien hay que pagar un poco adicional 3usd es muy sabrosa y variada y momento perfecto para interactuar con otros pasajeros. Muy cerca de crazy house. Es posible agendar tours ahí mismo. Excelente experiencia! Best hostel I have been. Staff are very friendly and family dinner is delicious and you can meet other travellers very easy. Definitely I would recommend thjs hostel If you go to Dalat. This has got to be the BEST hostel I've stayed to date. Really comfy beds, lovely bathrooms and beautiful views! The staff are absolutely amazing and the family dinners are delicious! I highly recommend this place. Only downside is they sponsor the weasel farms and sell the coffee (really bad animal cruelty). Made me tea when I was sick and sewed my pants back up when I ripped them. Amazing staff you have to stay here!!! You do an amazing work, keep doing like that! Best decision to stay here, family dinners are a must, stuff is incredible. Book the cannoning tour and you won’t regret it! Everything perfect! The best hostel i stayed in SE Asia, the bathroom was like in a 5 stars hotel, the dinner excellent, and the staff really friebdly! Special atmosphere. Staff very helpful and kind. You will be like at home. Excelente hostal. Las camas muy cómodas, limpian todos los días las habitaciones y los baños. Desayuno incluido, que cambia cada día asique no te cansas. Se puede cenar en el hostal (por un extra de 3USD). La cena es un montón de exquisitos platos diferentes que se comparten con los demás comensales. Es seguramente el hostal más sociable en el que he estado y el ambiente es muy bueno. El personal es muy amable y siempre ayuda en lo que se necesite. También se puede contratar tours y canyoning. Great hostel, I recommend the "family dinner" plenty of food and nice too. Staff is great and sweet. Really helpful.